I’ve been having a lot of fun playing Valve’s new card game, Artifact, since it launched on Wednesday. It is surprisingly easy to learn and is an interesting take that borrows from Hearthstone and Magic: The Gathering while doing something new. The game also treats its digital cards unusually, letting people buy and sell their cards. I was sceptical about that last bit, but I’ve found it refreshing. Artifact costs $20 and gives players 10 card packs that will contain some of the game’s current 310 cards. You can’t grind through matches to earn the right or the in-game currency to obtain new cards. In fact, there’s no real progression system in the game. The only way to get more cards is to spend real money on cards, with Valve getting a cut of each purchase. This has earned the game grief on its Steam page as player reviews denounce it for being pay-to-win. The game’s most expensive card is Ax. At the time of writing, there are about 400 circulating on the Steam Marketplace with a median sell price of around $20. The card features a red giant wielding a giant axe. His impressive stat line is: seven attack, two armour, and 11 health. He’s a beast in the early rounds. Ax is highly prized in Artifact’s meta-game strategy, which has been slowly building since the closed beta. Prices for the card have fluctuated, reaching $30 (about £23.50) on Wednesday, dropping to the teens hours later than going back up. After some wild spikes the market price for Ax appears to be levelling out. This volatility may be driven by supply as more people open card packs or by speculation on the part of people looking to game the Steam Marketplace to turn a quick profit. It is understandably frustrating. I want to buy Ax, and I’ve struggled to figure out the right price to pay. There’s a silver lining though: most cards in Artifact aren’t Ax. There are currently 310 cards in the game. That’s slightly more than the core set in Magic: The Gathering that gets updated each year. There are three types denoting how likely they are to drop when opening new packs: common, uncommon, and rare. A common New Orders spell card is going for $0.04. An uncommon hero Viper is going for $0.07. A rare Poaching Knifeis going for $0.47. Players have already created programs to measure how much it would cost to buy the entire set at a given moment. That number is around $300 (£235), but it fluctuates. You can currently buy all common and uncommon cards for just under $40 (£31). Buying some of the currently most competitive decks might cost $30 (£23) or more. You can effectively play with most of the cards in the game, exploring all of their strategies and styles, for very little compared to most other card games, including free-to-play ones like Hearthstone, where serious players can be expected to spend $200 to get most of the cards in a new expansion. Unlike in other digital card games, there’s no way to grind for free packs in Artifact. Some players have been arguing that Artifact isn’t a rip-off on the game’s subreddit. While there’s no way to grind for new cards for free, Artifact is unique among digital card games in making it possible to skip grinding and loot boxes by spending a little extra money. Today I spent $15.92 (about £12.47) to make a black deck based around casting death spells and outfitting my heroes with powerful items throughout the course of a match. It’s been a blast to play, and it’s helped me do well in the casual mode I’ve been matchmaking in. It was also wonderful to be able to simply buy the cards for rather than have to hope for the luck of the draw while opening pack after pack. It was a relief to not have to grind for weeks on end as I would in Hearthstone. This is a model familiar to anyone who’s played Magic: The Gathering, where players can buy boxes of booster packs when a new expansion hits or wait and buy individual cards when they’re resold. While Artifact cards each cost less on average, you also don’t need duplicate copies of many of the most expensive ones. An Artifact deck can only have one Ax card, whereas MTG decks can include up to four copies of the rarest and most powerful cards. 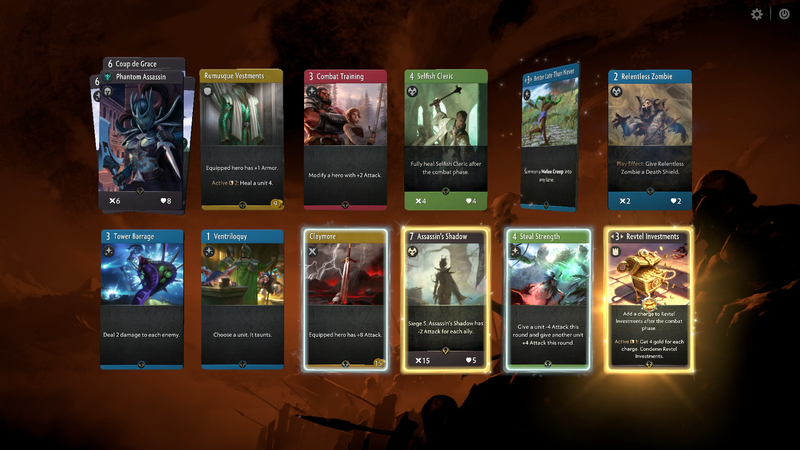 It’s unclear how Artifact’s economy will shake out over the long term as more card packs are open and new players stop joining its market, but currently the game also has another virtue other digital card games don’t: if I decide to stop playing, I can cash out my collection and go buy other Steam games with it.